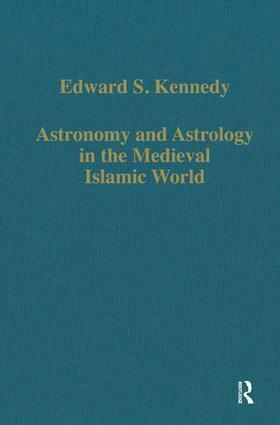 This collection of studies by Edward Kennedy looks first at questions of spherical astronomy, celestial mapping and planetary models, and then deals with astrological calculations. Throughout the author emphasises the importance of advances in mathematics for understanding the development of medieval Arabic sciences. This collection of studies based on previously unexploited manuscript sources in Arabic and Persian. They were written by authors from the 9th through the 15th centuries, whose locations reached from south China in the east through Central Asia, the Middle and Near East, and North Africa, to Spain in the west. The topics are predominately astronomical rather than astrological. The former include eclipse predictions, problems in spherical astronomy, non-ptolemaic planetary theory, and the achievements of Ulugh Beg and his observatory. Astrological subjects treated are the method of calculating the ascendant, and how to determine astrological houses and lots. An astrological history of the career of Genghis Khan is also described. Contents: Preface; Astronomy: Habash al-Hasib on the melon astrolabe; Two topics from an astrological manuscript: Sindhind days and planetary latitudes; Al-Sufi on the celestial globe; Applied mathematics in the 10th century: Abu’ l-Wafa’ calculates the distance Baghdad-Mecca; Two mappings proposed by Biruni; The spherical case of the Tusi couple; Spherical astronomy in Kashi’s Khaqani Zij; Two medieval approaches to the equation of time; Ibn al-Haytham’s determination of the meridian from one solar altitude; Ulugh Beg as scientist; The heritage of Ulugh Beg; Planetary theory: late Islamic and Renaissance; Two tables from an Arabic astronomical handbook for the Mongol viceroy of Tibet; Eclipse predictions in Arabic astronomical tables prepared for the Mongol viceroy of Tibet; Astrology: Al-Biruni’s treatise on astrological lots; Ibn Mu’adh on the astrological houses; An astrological history based on the career of Genghis Khan; Treatise V of Kashi’s Khaqani Zij: determination of the ascendent; The astrological houses as defined by medieval Islamic astronomers; Index.